After reviewing a bunch of options, I found ScanStrut to have the best quality and most options from me to choose from. I visited a couple of marine stores and looked at their design, as well as wandered around my marina to see what others used. I knew I wanted it stern mounted because of the wiring headaches of trying to get it up the mast. 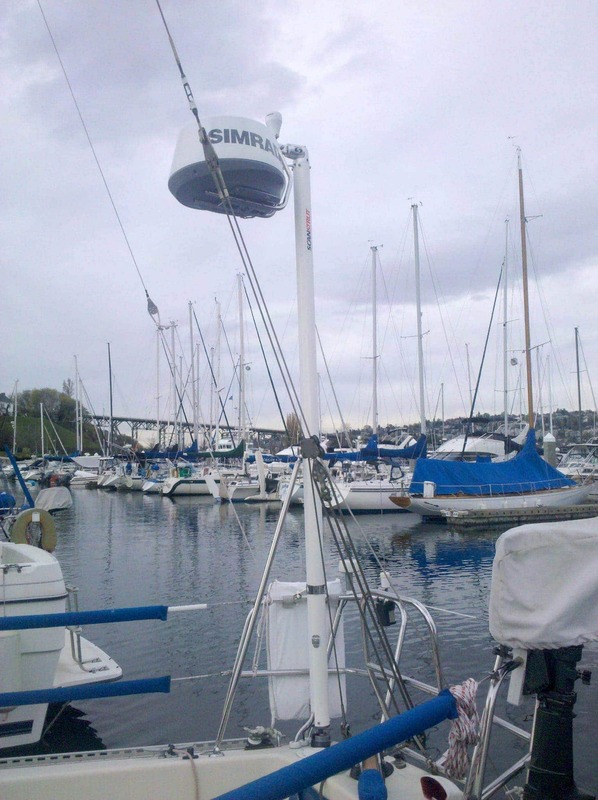 The three choices I had left were: pole mounted, backstay mounted, self leveling radar pole mounted. 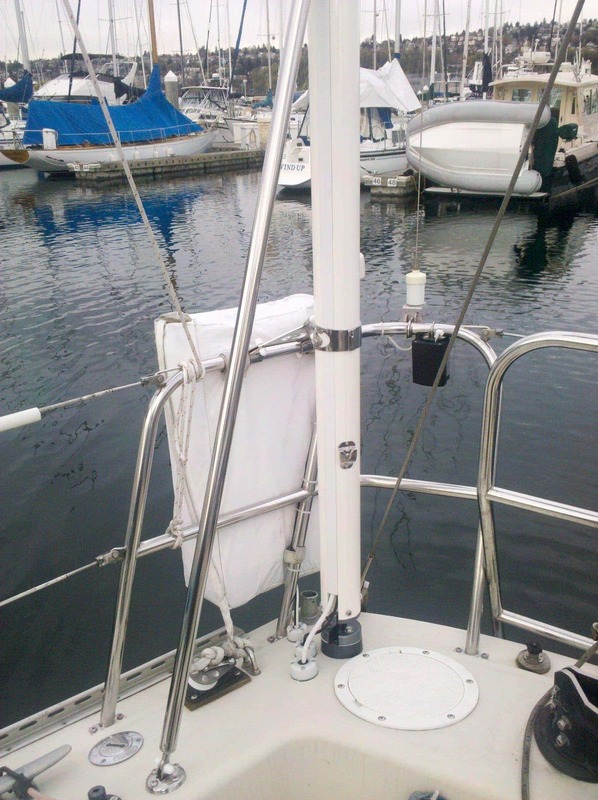 My preference initially was backstay mounted, which ScanStrut has a very nice kit for. Unfortunately, I have a swim ladder and split backstay, so making this work was either going to require major modifications to the kit, or losing my swim step’s functionality, and drilling holes in the stern of the boat, which is angled a bit and would have been somewhat more difficult. So I chose the self leveling radar pole mounted option. In addition, I added the GPS/VHF mount so I could mount my new Simrad GPS antenna here as well. I mounted it on the port side of the boat right near the stern. It turned out really well. The main attachment point at the bottom of the pole is a ball and socket joint with very tight connections once you tighten things down. It’s also connected to the railing for additional lateral support, and you can see the forward facing support pole as well. It doesn’t obscure any lifeline areas. One side benefit is that I was able to mount a bracket on the lower portion of the pole for my VHF handheld extension for my Icom radio. Far better than having it in the pocket nearby where it’s hard to hear. The ScanStrut kit was extremely well designed – detailed plans for installation with very clear instructions and options. The quality of the pole and mount was excellent at every level. From the snap on caps to protect the screws, to the obvious quality in the head unit that provides the self leveling. Cables run through the side of the pole and are covered well, and easy to access at the bottom of the pole. The self leveling part of the unit has worked very well so far, and the radar performance is great having it always level even while sailing. GPS accuracy is good as well since the antenna is away from all of the other junk and interference and is also always level. I would highly recommend the ScanStrut product – it’s a bit more pricey that some of the other options out there, but the quality is well worth the extra cost, especially for something this important.